I had the opportunity to visit the new Boulangerie Patisserie les Halles twice this past week. 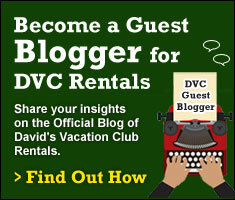 It was all in the name of work, of course – someone’s got to do it, right? 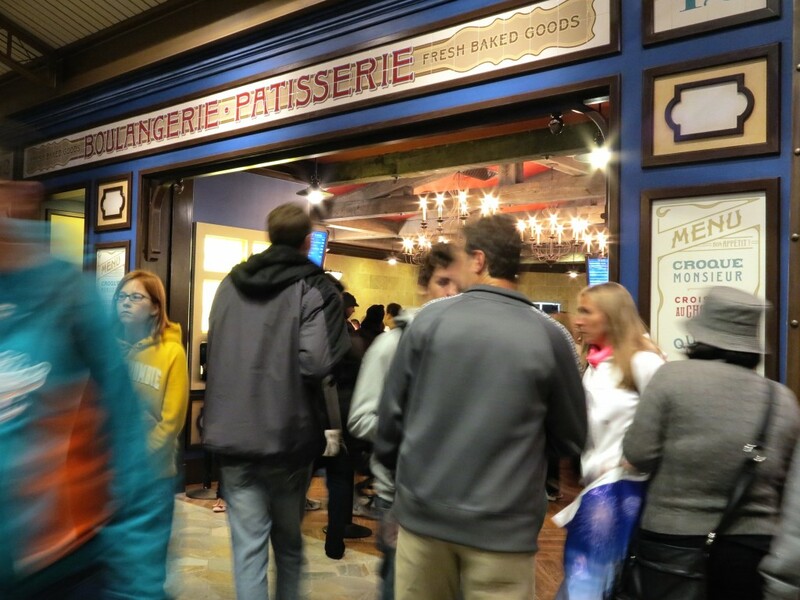 The old Boulangerie Patisserie was a little hole-in-the-wall bakery located in the France pavilion at Epcot. The only seating available consisted of a few bistro tables outside. Despite the lack of seating, the bakery was always filled to the gills with guests lusting over the delectable offerings. While there were a few savory options, most folks made the journey to the Paris back alley to indulge in the bakery’s luscious sweet pastries. The tiny French bakery was recently re-imagined has moved into a much larger space. The new Boulangerie Patisserie les Halles is located in the back of the gift shop that the Impressions de France movie empties into. If you remember, there used to be a small seating area and a Kidcot station in that location. Now that entire area is seating for the new bakery. 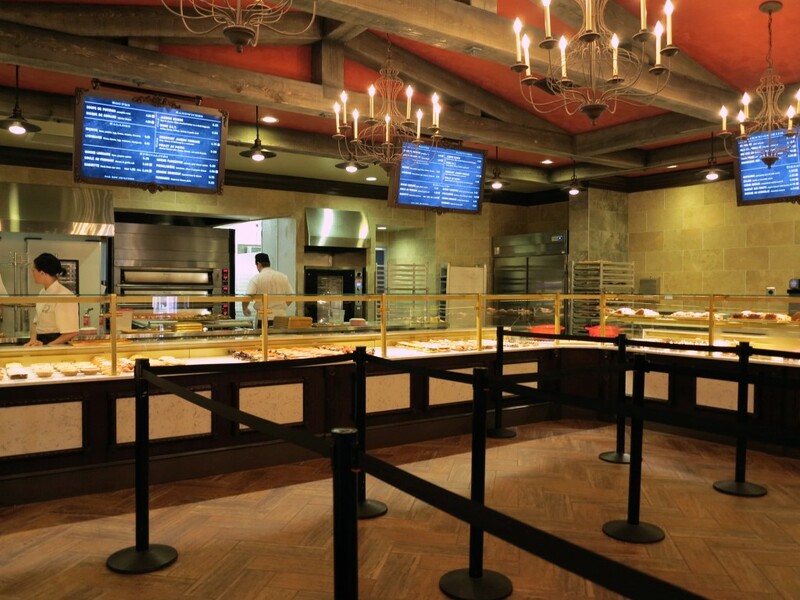 The bakery itself is located in a brand new addition that bumps out from the back of the building. Boulangerie Patisserie les Halles feels more like a bistro than a patisserie to me. 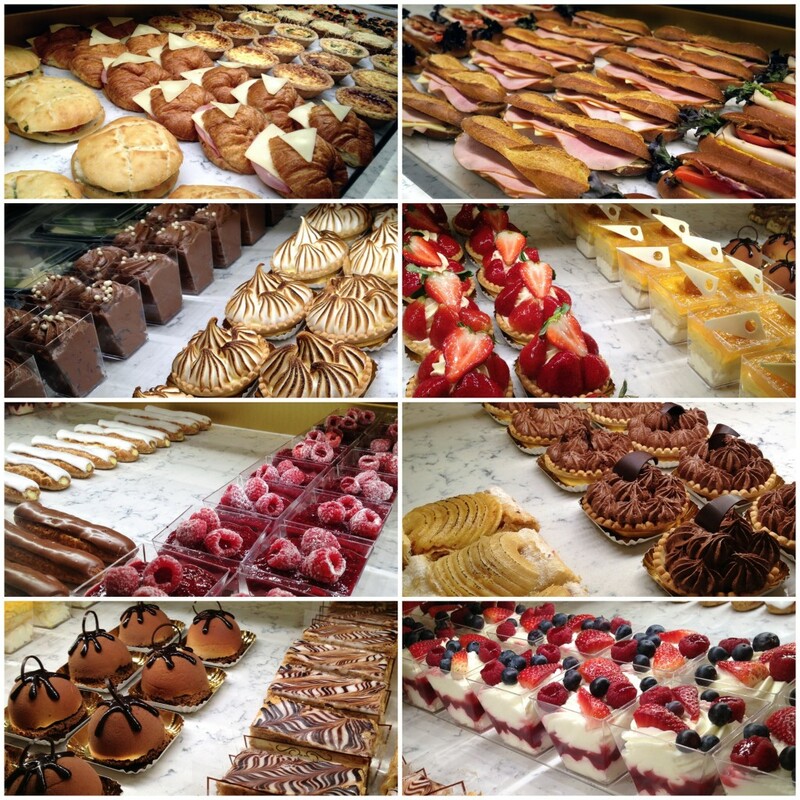 A patisserie is simply a bakery where French pastries are sold. But here, in addition to pastries, you’ll find soups, salads, sandwiches, and drinks. With the new changes I think of it more as a new quick service restaurant, rather than a place to just get a delicious snack. Just like the old Boulangerie Patisserie, the new, bigger, better version is quite popular. When I went the first time, sometime midday, it was packed. It was so crowded in fact, I had a hard time getting any pictures to share with you. 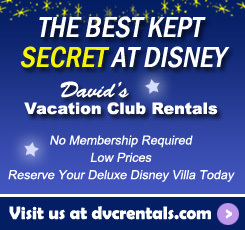 The second time I went it was a much nicer experience. 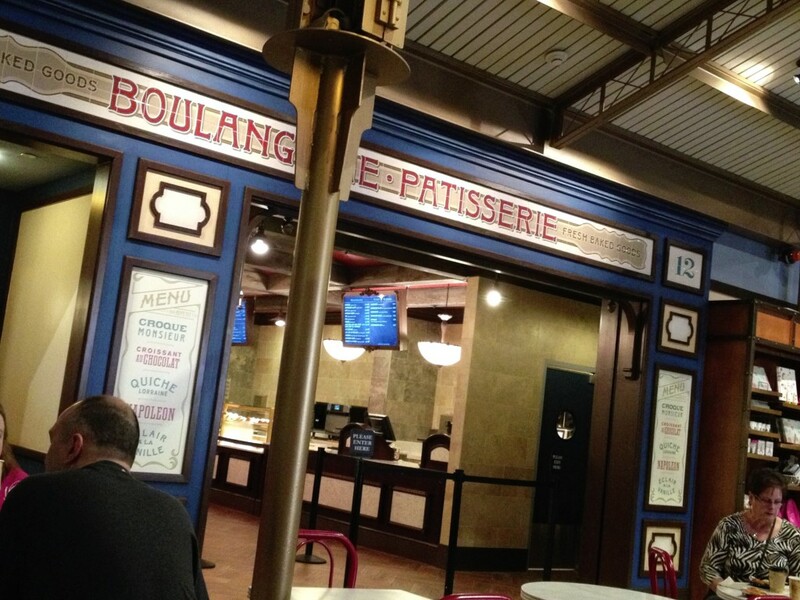 I entered Epcot through the International Gateway, near the Epcot resort area, first thing in the morning and was able to enjoy Boulangerie Patisserie les Halles without the crowds. 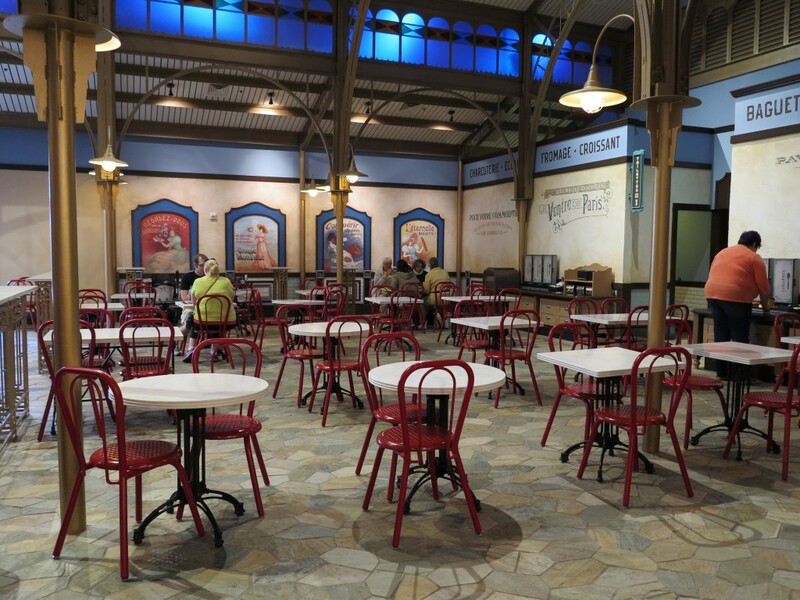 The patisserie/bistro opens at 9 am, so you can go there for breakfast, then make your way to Future World until the rest of World Showcase opens at 11 am. As far as the food goes, I’ll let you be the judge. I was able to sample an éclair, quiche and chocolate croissant and I enjoyed all three. Here are a few pictures to tempt you to give this new eatery a try! Oh, and in case you’re wondering, the old bakery is also being remodeled and will reopen soon as an ice cream shop. 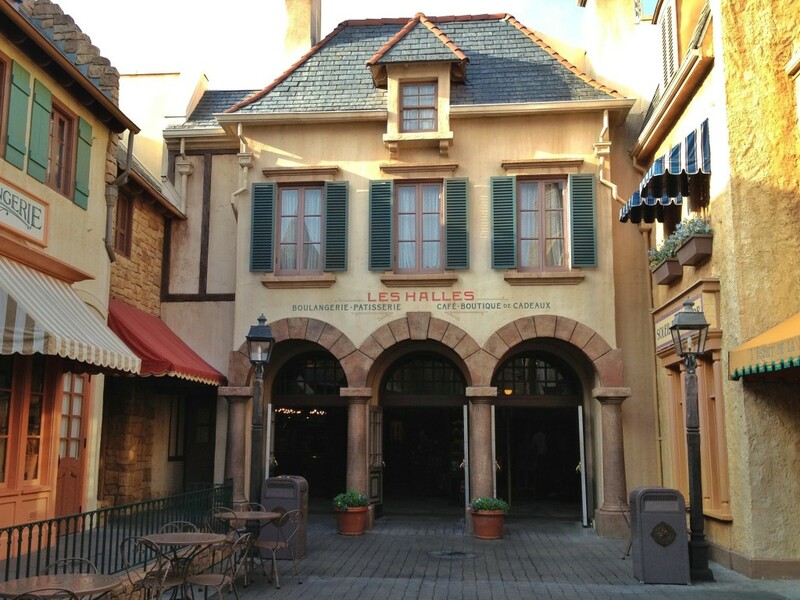 One thought on "Epcot’s New Boulangerie Patisserie les Halles Open in France"
My son and I ate breakfas from that little shop, on those very tables outside. Can’t wait to go back and see the new shop, but I liked the quaintness of the smaller shop.